A funny thing happened on the way back to Central City. I read the first of “The New 52” that I fully enjoyed with no reservations. The reboot on Flash is simple and it works. Writer and artist, Francis Manapul takes a broom and a dustpan to over 50 years of ever-more complicated continuity and sweeps it clean. Back in place is a younger Barry Allen, experienced as Flash, but not experienced enough to have died repeatedly and been replaced and resurrected repeatedly. Gone is the Batman-esque tortured soul of the recent REBIRTHed Flash. Barry is a young professional crime scene investigator on the laboratory side. He's a big O.C.D. And self-deprecating but highly intelligent and confident. And he is a hero simply because it would be wrong to have his powers of super-speed and not be a hero. He cares about people and he cares about what's right. This was a refreshing comic and a refreshing take on the relaunch without regressing our lead character to the point of mental infancy nor did it incorporate the darkness and bloody gore that permeates so much of the recent & new DC (so far as I've seen). So, hold on to your hats as I recommend this one for old-school and new-school readers out there. What I discovered, to my surprise, is that Manapul is able to visually tell a story and make it flow smoothly and still incorporate some “Wow” moments with the action. In fact, the 2-page spread that makes up the title page and origin recap is one of my favorite images from all “The New 52” that I've actually had the fortune (or misfortune) to read recently. I enjoyed the dialogue and the way Manapul often integrates the panels and word balloons to move the narrative along. It gives a real sense of movement, which is always a trick for a comic book about someone with super-speed: How do you take static panel-to-panel storytelling and get a sense of movement and speed? I thought Manapul paced everything just right to give us ebb and flow, action and mystery, characterization and depth, and a strong cliffhanger. Glory be, the plot does not revolve around Prof. Zoom or any of the familiar Rogues Gallery of The Flash, but rather a genuine mystery surrounding an old college classmate of Barry's. I love the Rogues and I love the Prof, but it felt nice to be re-introduced to Barry and Iris without the plot albatross of Zoom's (or other Rogues') evil machinations. It allowed me to just focus on Barry and, to a lesser extent, Iris. 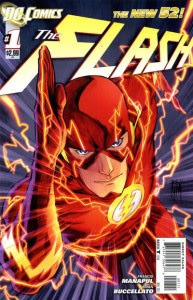 For most of the last 10 years or so, the focus of FLASH comics have for ill or good been a place where Flash himself is secondary (or even periphery) to the story itself. This is fine, occasionally, to mix things up in a long-running title, but when it becomes the norm to have the title character essentially a guest-star or supporting character to his own book...well, that's losing focus and the writer needs to get reined in. Visually, I found the art impeccable and often stunning. Manapul's art is both finished out and enhanced by Brian Buccellato's expressive coloring work. I recently came across a quote from the late, but not forgotten, comic coloring legend, Adrienne Roy. Roy said ‎"Color leads the eye and helps tell the story subconsciously...it should never distract from the even flow of the total creation." Buccellato's work on this comic exemplified her statement. I especially liked his repeated use of a muted violet offsetting the strong red and yellow of The Flash. You can see an example even on the cover. It helped set a different tone for this comic from any other I had read from DC. One of the things that's so easily overdone for the last few years of FLASH comics has been the coloring effects that have laid in the electrical charge bolts flying off his body. I understand that the intention has been to give a visual sense of movement and excitement to the character even when he's standing still. However, surely everyone else has caught on to how overdone it had gotten by the end. Well, here, Buccellato works off of Manapul's pencils to create slight variation on that visual that works very well for me. In the Silver Age, The Flash had his Flash ring that when Barry pressed a button on the side, it would open up and his cloth uniform would fly out in grand Infantino-esque fashion to expand until large enough for Barry to change his clothes at super-speed. In 2011 and forward, the ring utilized some sort of higher tech to electrically fire the top of the ring outward where it expands and attaches to his chest to form his Flash insignia and the costume itself flies out of the chest piece in parts that form-fit around his body. 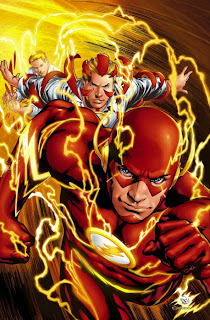 The seams where those parts connect are the areas that we see electricity charge up when Barry takes off into super-speed action. I was very surprised by THE FLASH #1. I did not like his characterization in the last, truncated FLASH comic, nor did I care much for him in the FLASHPOINT mini-series. I am also a bit saddened by the disappearance of Wally West/Kid Flash from continuity because he was a character I always enjoyed from his Kid Flash days through his 20 years or so as The Flash himself, but if DC continues to take care of Barry like they did in this comic, then the future looks quite decent for THE FLASH.